Capt. Reid K. Nishizuka, 30, of Kailua, Hawaii, was one of four airmen who died on April 27 near Kandahar Airfield in Afghanistan in the crash of an MC-12 aircraft. He was assigned to the 427th Reconnaissance Squadron at Beale Air Force Base near Marysville in Northern California, and was supporting Operation Enduring Freedom. The cause of the crash is under investigation, but the Department of Defense said initial reports indicate there was no enemy activity in the area at the time. 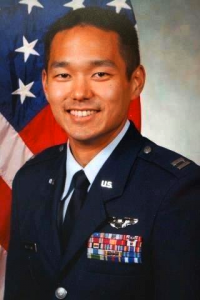 Nishizuka’s body was flown to Dover Air Force Base in Delaware on April 30. Capt. Chad Nishizuka, an Air Force weapons system officer, escorted his older brother back to Hawaii, where a service was planned. Reid Nishizuka attended Kailua High School, where he joined the Jr. ROTC program. Upon graduation in 2009, he went on to the ROTC program at Notre Dame University in Indiana, studying aeronautical engineering. He entered military service in June 2005 and completed multiple deployments to Iraq and Afghanistan. Nishizuka arrived at Beale AFB in November 2012 and deployed to Afghanistan for the last time this spring. Brown ordered that flags be flown at half-staff over the State Capitol, and Nishizuka’s family will receive a letter of condolence from the governor. Rep. Colleen Hanabusa (D-Hawaii), a member of the House Armed Services Committee, said in a statement, “I join Hawaii and our nation in mourning the loss of Air Force Capt. Reid Nishizuka in Afghanistan, as well as Capt. Brandon L. Cyr, Staff Sgt. Richard A. Dickson, and Staff Sgt. Daniel N. Fannin. Our defense relies on the courage and commitment of individuals like Reid and his compatriots, who stand ready to sacrifice for our nation. Our sadness is tempered by the pride we feel for those who serve.